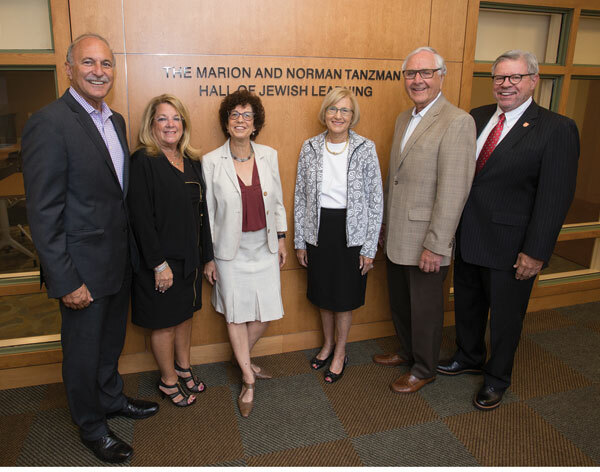 At the dedication ceremony of the Marion and Norman Tanzman Hall of Jewish Learning are, from left, Roy Tanzman and Brenda Tanzman, Bildner executive director Yael Zerubavel, Rona and Jeffries Shein, and Rutgers University chancellor Richard Edwards. A $1 million grant from the Marion and Norman Tanzman Charitable Foundation has provided a new study space for Rutgers University students taking Jewish studies courses. 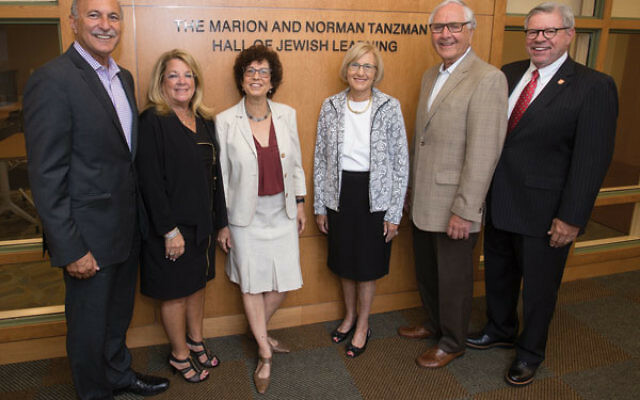 The Marion and Norman Tanzman Hall of Jewish Learning is the result of the renovation of unused office space into two rooms, a 50-seat multipurpose room and a 20-seat classroom, both equipped with the latest smart technology, said Bildner associate director Karen Small. The hall was dedicated at a Sept. 18 ceremony. The space, located in Miller Hall, on the College Avenue Campus in New Brunswick adjacent to the university’s Allen and Joan Bildner Center for the Study of Jewish Life, and situated next to the offices of center faculty, “will augment Jewish learning and the Bildner Center’s educational mission by serving as dedicated space for Jewish studies classes and for seminars and small conferences,” said Small. While half the building was refurbished several years ago for Jewish studies faculty offices, the other half had fallen into disrepair because the center ran out of funds, said Small. “It had to be completely gutted,” she said, adding that a small lounge and bathrooms were also built as part of the renovation. The foundation funds were used to extensively renovate the aging building, but Small said the university threw its support behind the project as well, and provided the funds to replace the roof of the structure. In the lounge, furnished with couches, tables, and chairs, several students relaxed while waiting for class to begin. Bradley Dorfman, a sophomore from Millstone minoring in Jewish studies, said in comparison to other classrooms at the university, the Tanzman spaces stand out for their many “smart” technology features, including a computer set-up with a video screen. Said sophomore Torie Durkin of Cherry Hill, “It’s really nice that it’s kind of pushed back from the road,” referring to the fact that the building is set away from the bustle of College Avenue. About 90 people attended the dedication ceremony, including members of the Tanzman family, faculty of the Rutgers Jewish Studies Department, Bildner leaders and faculty, donors, and university officials, including chancellor Richard Edwards and Peter March, executive dean of the School of Arts and Sciences. Former state senator and real estate executive Norman Tanzman died in 2004, and Marion Tanzman died in 1994. Foundation president Jeffries Shein of Long Branch, the husband of their daughter, Rona, is himself a Rutgers graduate. The Woodbridge-based foundation also donated $1 million to help fund the kosher dining hall at the new Eva and Arie Halpern Hillel House. Moreover, Shein said, his in-laws were close friends of the Bildners, so it seemed “a natural thing” to contribute. Also present at the dedication was Roy Tanzman of Kendall Park, a nephew of the Tanzmans, a foundation officer, Rutgers Hillel board president, and also a Rutgers alumnus.